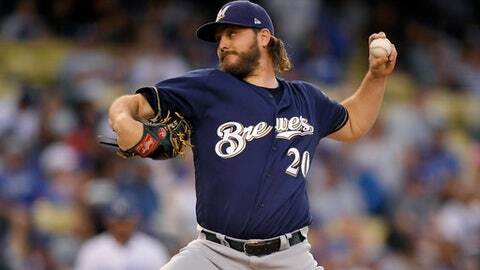 LOS ANGELES (AP) Wade Miley is a Louisiana guy with an affinity for Hollywood. Miley remained undefeated at Dodger Stadium, delivering seven scoreless innings in the Milwaukee Brewers‘ 1-0 win over Los Angeles on Tuesday night, hours after LA acquired second baseman Brian Dozier from Minnesota. ”I guess,” was Miley’s simple answer when asked if Dodger Stadium just agrees with him. The left-hander got some help from center fielder Lorenzo Cain, who appeared to rob the Dodgers‘ Cody Bellinger of a tying home run with a leaping catch at the wall to end the seventh inning. Cain also drove in Milwaukee’s only run with a two-out double in the third. The Dodgers lost their third straight on a day when they acquired Dozier from the Twins and reliever John Axford from the Toronto Blue Jays. Dozier, who arrived in Los Angeles on Tuesday night and watched the final two innings in uniform from the dugout, joins Manny Machado in the Dodgers’ revamped infield. Dodgers manager Dave Roberts and general manager Farhan Zaidi said the right-handed hitting Dozier was acquired, in part, to help the team improve against left-handers. ”If you look at this year, we haven’t really handled left-handed pitching so obviously with the acquisition of Dozier, he’s a guy that has throughout his career has fared well against left-handed pitching and adds length to our lineup,” Dodgers manager Dave Roberts said. Coming off a loss when he gave up a season-high tying five runs, Buehler delivered career bests in innings and pitches (105). Cain also took a potential extra-base hit away from Bellinger when he raced into the gap in the fifth. Roberts praised Bellinger’s at-bats, and Cain felt for the young Dodgers slugger. Dozier made it to the Dodgers’ bench in the eighth inning after heading to the Minneapolis/St. Paul airport immediately after learning about his trade. Dozier was on the active roster but did not get into the game. Upon arrival, he put on his No. 6 uniform, stretched and hit in the batting cage per instruction from manager Dave Roberts. Dozier could be seen hugging his new teammates before taking a spot on the railing of the Dodgers’ dugout in the eighth. He was scheduled to pinch run if Matt Kemp reached base in the ninth inning, but Kemp lined out to end the game. Why the willingness to race across country when many players who were traded Tuesday were taking at least a day to report to their new teams? ”No days off. I don’t like days off,” Dozier said. Brewers: RHP Jimmy Nelson (shoulder surgery) followed his examination with orthopedist Dr. Neal El Attrache on Monday with a bullpen session at Dodger Stadium on Tuesday. He focused on offspeed pitches. Dodgers: 3B Justin Turner (right groin strain) had three innings worth of live batting practice Tuesday, and Roberts expects his middle-of-the-order threat to be back in the starting lineup by the weekend. … LHP Hyun-Jin Ryu (left groin strain) will pitch three innings in a rehab outing with Class A Rancho Cucamonga on Thursday. Brewers: RHP Chase Anderson (7-7, 3.69 ERA) will take the mound Wednesday looking for his first career victory at Dodger Stadium. He’s 0-3 there with a 4.15 ERA in six starts. Dodgers: LHP Rich Hill (4-4, 3.82) is coming off a strong outing at Atlanta on Thursday, when he worked seven scoreless innings in an 8-2 victory.